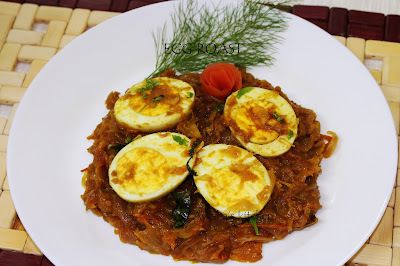 A spicy Kerala style egg dish where boiled eggs are cooked in roasted onion and spice gravy. Egg roast is mainly served as an accomplishment with Appam, Dosa, Puttu..and so on. Now it has become a part of Kerala breakfast, a native dish of Kerala . This is one of the easiest and yummiest way to include eggs in our breakfast menu. 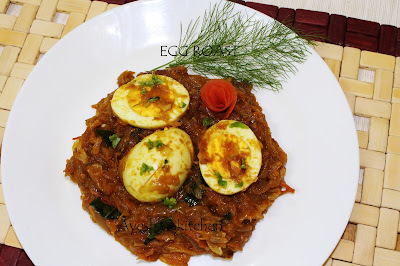 Though there are lots and lots of dishes using egg like egg chili, egg masala, egg curry, egg in roasted coconut gravy etc..i prefer to make egg roast which turns out well with Dosa. Here is the recipe for the perfect kerala style egg roast. Enjoy!! Heat oil in a pan and when hot splutter mustard seeds. When done, add sliced onion. Saute till onion becomes golden, in a medium flame only. More the onion is sauteed, more yummy the dish will be. Be careful, do not burn the onion by sauteing on high flame. When done, add green chilies along with salt. Again saute for a while and now add tomatoes sliced . Cook till the tomatoes are well done. When tomatoes are done, add turmeric powder, ginger garlic paste, garam masala powder and chili powder. Finally add the hard boiled eggs and gently mix. Cook for 2 minutes in a low flame. You can also toss the hard boiled eggs for 2 minutes in 1 tsp of oil before mixing it with the masala gravy. apply here one of the easy way to panseva is through online,which is one of the easiest method.Looking for a new pan card then apply here in a easiest step.